Mag. 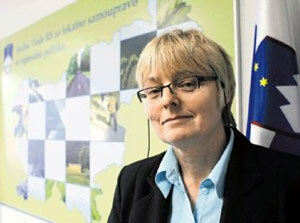 Zlata Ploštajner is the minister without portfolio in the new Slovenian government, responsible for local self-government and regional development. Solid economy is also the basis for the survival of the Carinthian minority. The Alps-Adriatic Centre for Cross-border Co-operation (AACC) in Klagenfurt offers its services to the potential cooperation partners on both sides of the border. Regretfully both Carinthian border regions are economically less developed. How should the Republic of Slovenia at least be a stimulate of the support for the development in these regions? Good development projects tend to overcome administrative and state borders. After Slovenia joined the EU and later also the unique Schengen border system, the opportunities for good project cross border cooperation increased significantly. I think it is necessary to exploit the instruments offered by EU for the cross border regions to its utmost and to obtain in this way the additional financial funds for the quicker development along the border. Slovenia directed the border regions already when preparing the programme documents to search for their development potentials in the cross border cooperation, too. This is the perspective way of activities , which should be developed and supported also now, when it is time to support the preparation of definite mutual cross border projects. In the arising Euroregion among the Alps, Adriatic and the Panonian Lowland I see a specific project cooperation which is in the interest of all participating sides. The supported projects will have to contribute to the economic development of the region, on the Slovenian and as well on the Austrian side, since the quicker economic development is one of the priority programmes of the cross border cooperation. At the same time the minority with its linking roll is a factor which can contribute to the quicker development, if we are able to exploit this potential with rational politics of the neighbourhood cooperation and transfer it to the faster development of the border region, not only with the support in the frame of the cross border cooperation but also with common projects with which we will be able to attract other European funds to the border regions,too. How do you evaluate the implementation of the projects between Slovenia and Austria, especially Carinthia, which are being financed by the EU ? The cross border cooperation with the support of the EU funds is existing at the Slovenian-Austrian border since the year 1995. In this period the cooperation was going on very intensively, from the initial getting to know each other to the definitions of mutual areas of the interest and transfer of experiences. In the period 2004-2006 we supported 25 projects in Slovenia , which founded cross border cooperation with partners from Austrian Carinthia. The supported projects gave numerous definite useful results , from which people of the border regions profit , however it is maybe more important to stress that through the projects connections were formed and the confidence was built , what enabled us to begin with more demanding forms of the mutual cooperation without difficulties. The conditions of the past cooperation namely did not demand urgently so intensive forms as in the programme period 2007-2013, when the preparation of the really mutual cross border projects is possible only under guidance of one, leading partner. Namely GOLR as a mutual management body issues mutual public competitions to which partners apply with mutual projects, bringing benefit for both sides. Additionally we believe that the minority will be as up till now actively involved in the numerous mutual projects and will in this way play a bridge roll at the border territory. In the frame of the Operative programme Slovenia-Austria 2007-2013 the first tender was issued on July 18th with several consecutive closing dates. For the first date 57 projects applied ,what shows that there is a big interest for cross border cooperation in this region. For the time being the evaluations of applications of the first date is going on, however this is no obstacle for the presentation of new project proposals, because the tender is open as long as the funds are available..